Patients with psoriasis were actually the first who were convinced in the healing influence of the Dead Sea. This category of patients remains the largest among patients who come to the Dead Sea for treatment. 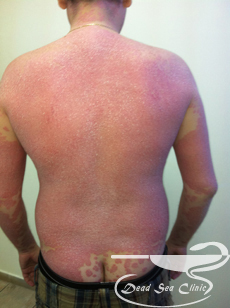 In the treatment of psoriasis are used softening oils, non-hormonal ointments, drugs based on Dead Sea minerals, balneology-dosed heliotherapy, thalassotherapy, mud therapy and physiotherapy. One of the advantages of the “Dead Sea Clinic” in comparison with other places is the geographical location, it is located on the Dead Sea shore, in the same building with the only beach in the resort of specialized – “solarium – 400m”, for patients with psoriasis, separated for men and for women. The well-equipped beach, designated specifically for patients with psoriasis, where patients without bathing suits can spend hours to expose themselves to the sun and at the same time to luxuriate in the Dead Sea water, and here, without spending a lot of time walking under the hot sun, take medical treatments in terms of comfort, and what most important, under the constant supervision of clinic staff. The Dead Sea Clinic present for their patients who suffer from psoriasis of the skin and nails a unique laser for treatment that gives more lasting remission without medication.